If you are trying to improve your diet, one of the first recommendations made by nutrition experts is often to reduce your intake of added sugar. Sounds simple, right? Well, it would be if there weren't so many different words for sugar used on food labels. But the fact is that sweeteners may be added to your food under a wide range of names—none of which sound like sugar. In fact, many of the ingredients sound healthy. And sugars may be added to foods that aren't sweet. Making it that much harder to monitor your intake. For these reasons, it is smart to learn the different words for sugar so you can spot it in your food and decide if the products are right for you. Sugars are a type of carbohydrate sometimes called “simple carbohydrates.” Sugars occur naturally in many foods, such as the fructose found in fruit or the lactose in milk. But in some cases, manufacturers also add extra sugars to processed foods. Sometimes they add or balance flavor. For example, sugar might be added to a savory salad dressing, to peanut butter, or to spaghetti sauce. Or a sweetener might be used to thicken or add texture to food. Added sugars also include any sugar product that you add to your food at mealtime. This may include table sugar that you add to your morning coffee or cereal. It may also include syrup that you add to your pancakes or agave syrup that you add to your smoothie. Anyone who is looking to improve their eating habits should be aware of added sugars. In many cases, you may be consuming far more sugar than you realize and if it exceeds recommended guidelines it can have an impact on your health. Recommended guidelines according to several national and worldwide health organizations (including the USDA) state that added sugars should total no more than ten percent of your total daily calorie intake. According to the National Institutes of Health, several studies have found a direct link between excess sugar consumption and obesity and cardiovascular problems worldwide. Certain people, such as those following low carb diets for weight loss or to manage a medical condition should be especially careful. The presence of these sugars often signals a higher glycemic index in the food. Although for most purposes simply knowing the carb count is enough information for those following a low carb way of eating, there are times when you may need more information to make a healthy choice. That is, you need to know whether and how much sugar was added to the food during processing. For example, if the label for a bottled sauce says that a teaspoon of that food has “zero carbs,” that number may have been rounded up or rounded down. And if you consume more than the amount indicated as the serving size, you may in fact be consuming enough sugar to affect your health. By reading the label, you see whether sugar was added to the sauce and can sometimes get an idea of how much. A careful reading of labels is necessary to know how much added sugar you are consuming. Ingredients are generally listed according to the amount included in the food. For example, the first ingredient in bread is usually some type of flour because there is more flour than any other ingredient. Water is usually the first ingredient listed in many beverages. But this is another reason that finding sugar in food can be tricky. 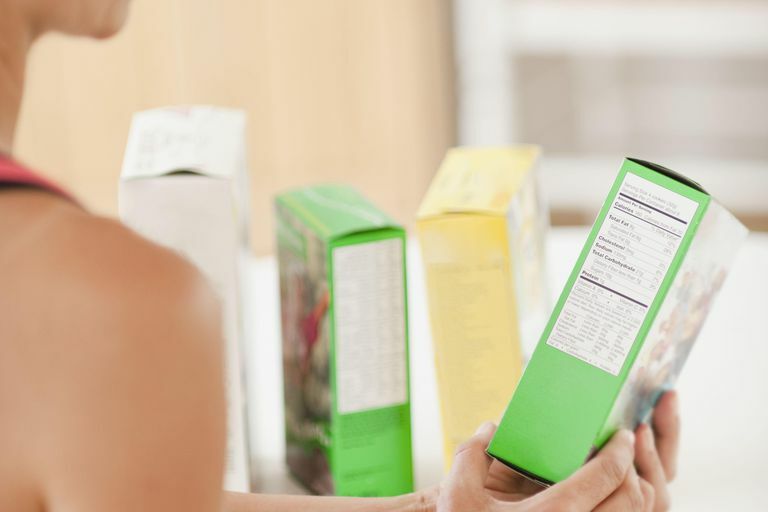 Sometimes there will be small amounts of many types of sugars, so none of them end up being in the first few ingredients of the label—even if the food contains substantial amounts of added sugar. Other times, sugar masquerades as a "healthy” ingredient, such as honey, rice syrup, or even “organic dehydrated cane juice.” Because the word "sugar" is not part of the name, it doesn't sound like it is sugar. Sometimes fruit juice concentrate is included in a food which sounds wholesome, but usually, the juices chosen, such as white grape, apple, and pear juices, are among the least nutritious of the juices. By the time they are concentrated, very little remains but the sugar. Here is a list of some of the possible words for “sugar” which may appear on a label. You'll notice that the words “syrup”, “sweetener”, and anything ending in “ose” can usually be assumed to be “sugar.” If the label says “no added sugars”, it should not contain any of the following, although the food may contain naturally-occurring sugars (such as lactose in milk). A lot of "Sugar-Free" foods have ingredients called sugar alcohols in them. These include ingredients such as maltitol and sorbitol. Sugar alcohols aren't sugar and they are not alcohol. But they may impact your blood sugar levels, and in fact, some believe that these ingredients can be as bad or worse than sugar. If you see ingredients ending in "ol" it may be a sugar alcohol. If you are watching your sugar intake to manage a health condition, get more information about the specific ingredient (and how it might affect your health) before consuming it. Trying to remember all of the different words for sugar can seem like a daunting task because there are so many different terms to know. But once you get the hang of it, finding hidden sugar in your food becomes easier. Once you learn how to identify sugar, you'll become better at choosing foods that align with your particular nutritional plan and program for wellness.